Career Day is approaching, and Annie can’t wait to show her family what she’s planning to be when she grows up. But, she must keep it a secret until Friday! So curious family members each ask Annie for a clue. Convinced that she’ll be a news reporter like he once was, Grandpop gives her his old camera and notebook to use for her presentation. Grandma is sure Annie wants to be a champion baker like her, so she offers a mixing bowl and oven mitts to Annie. Hopeful she'll become the mountain climber he aspired to be, Dad gives Annie an old backpack. Mom presents Annie with a pair of high-top sneakers to pursue Mom's favorite sport in high school -- basketball. Grateful for each gift, Annie cleverly finds a way to use them all to create her Career Day costume. When the big day arrives, Annie finally reveals her out-of-this-world dream to everyone. I'm always on the lookout for kids books that have females as a main character, and if they are non-traditional, so much the better. That the female character, Annie, wasn't white was a plus. Plus, you know, space. The final frontier. When I was growing up, one of my goals was to have a job on the starship Enterprise. So this book just was calling my name. All that said, I wasn't wowed by the book but I liked it. We aren't told Annie's dream right off, but each page contains hints and references to what it is. Not only is it a secret from the reader but also Annie's family. Nevertheless, each relative she talks to shares their excitement about their own hobbies or activities and contributes something to Annie's project. Annie showed good imagination and creativity in creating her project, incorporating her family's donations. 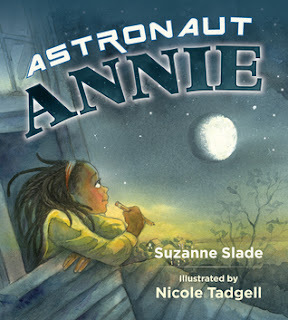 I do wish the book had hinted more at what Annie needs to do to make her dream come true, but I love Annie's can-do attitude and the book's positive message. There's a nice mini resource page and bibliography at the back of the book for children or adults who want more information on women in space. Overall, we liked the book. Liam loved it and now wants to build an astronaut suit like Annie's. (I have hidden my oven mitts). Any book that gives me a chance to have a conversation with my son gets a thumbs up. The fact that this one also has a pretty good message makes it even better. The mini resource page in the back is pretty cool. It gives actual proof that girls can be astronauts and it isn't just a pipe dream or science fiction fantasy. The only thing they could have done better was mentioned the first actual woman in space, Valentina Tereshkova. She went into space in 1963, twenty years before Sally Ride.